"Ghostwatch was a dramatised investigation of "the most haunted house in Britain". The unremarkable three-bedroomed terrace house "in Foxhill Drive. Northolt, Middlesex" was home to divorcee Pam Early and her two daughters. They had been tormented for several years by voices, loud thumps in the walls and pipes, objects moving inexplicably around the house." ...Begins a five-page article written by Bob Rickard for Fortean Times magazine, published in 1993. The article simultaneously serves as a review, critique and dissection of the film and the unprecedented impact it had on viewers post-broadcast. It also features opinions from Stephen Volk, and others who contributed to the production, and even some comparisons (plot-wise) with the much-documented, true-life Enfield Potlergeist case. The article concludes with various paranormal experts being asked to voice their own opinions of the film - such as, Guy Lyon Playfair, John, Lord Haddington, Maurice Grosse, Alan Gauld, Susan Blackmore, Anthony D. Cornell and Manfred Cassirer. "After at least one postponement, the Broadcasting Standards Council finally published their deliberation of the BBC1 Hallowe'en drama Ghostwatch, shown on 31 October 1992. The BSC (Bulletin no.24, Jan 1993) said they received 33 complaints - compared to least 20,000 received by the BBC - and have "decided that the complaints lay outside its remit". Most callers felt that this fictional programme breached the trust between broadcaster and audience, and the BSC deems this was not a matter of "taste and decency". 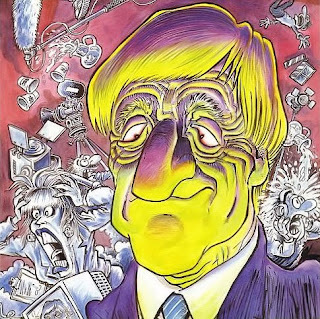 Star of Ghostwatch Michael Parkinson (who features on our cover) enraged many by gloating: "If we've scared the pants off people, we've done our job well." Read all about it in our 'Hoax!' section this issue - see p 38." SPECIAL MENTION: The quite fantastic cover for this particular publication was designed by renowned comics artist, Hunt Emerson. Be sure to check out Hunt's website, LargeCow.com, which features a wide selection of his work, past and present.